75 years ago, a young white tailed deer named Bambi frolicked into the hearts of America. Disney’s Bambi celebrates his diamond anniversary with a brand new anniversary edition Blu-ray from the Walt Disney Signature Collection that arrived in stores last week. The film introduced viewers to Bambi, his friends Thumper the rabbit and Flower the skunk, and shows the trials and tribulations of these woodland animals as they navigate childhood, love, and loss. The film features one of the most heart wrenching scenes in film history as Bambi’s mother is shot dead by a hunter. This scene was so impactful that the American Film Institute listed “man” as their #20 greatest villain in their 100 Years… 100 Heroes and Villains list. Bambi overcomes, and soon the animals grow up, fall in love, and live happily ever after. Check out the special features below. 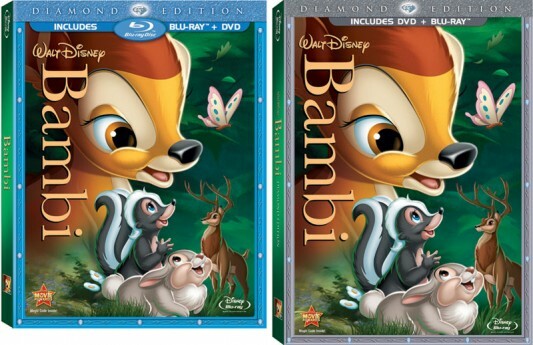 This Bambi: Diamond Edition is going back into the Disney Vault on April 30, 2012, so if you’re a fan of the film, it’s definitely worth grabbing before it’s put out of circulation. Once it goes into the Vault, the price on existing stock will shoot up (possibly as high as $70) and no new copies will be made and sold. The Diamond Edition includes both DVD and Blu-ray edition of the film (with a choice of two different packagings) and is packed with bonus features, which I detail here below. If you’re a fan of Disney animation, the extras included here will be a real treat. If your children have already learned about the Circle of Life from The Lion King, there’s more harsh life lessons to be learned from Bambi. While the 70-minute Disney animated feature is high quality and beautiful, it’s certainly managed to traumatized plenty of youngsters since its release in 1942. 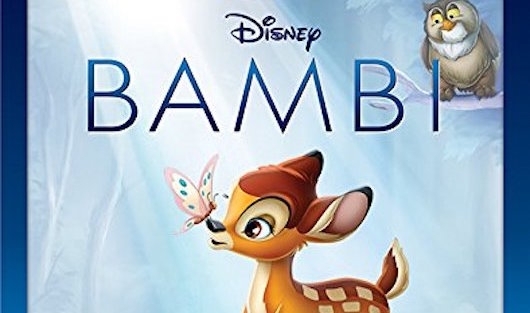 The film follows a young deer named Bambi from his birth through his adulthood, and while it’s a touching story of life’s adversities being overcome by love and the power of friendship, watching Bambi’s struggles will make you cry. If you don’t cry, well, then you don’t have a heart. Disney has been known to restore and re-release critically acclaimed works to the public for a very limited amount of time. 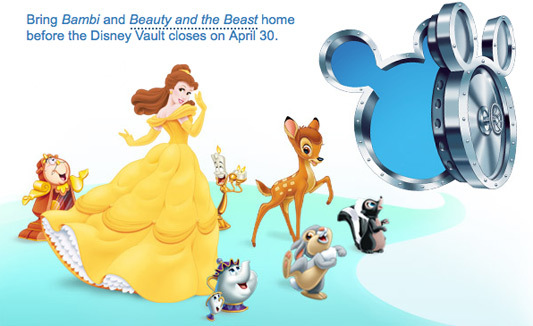 And if you haven’t reserved the time to purchase the Beauty and the Beast Diamond Edition and Bambi: Diamond Edition at your local video store or favorite website, then you have to hurry, because are heading back to the vault on April 30th, 2012. That’s less than two days away, so if you have been meaning to add these two titles to your library, then you better stop reading this post and buy it now before time runs out. Also going back into the Disney Vault at the end of this month is Beauty and the Beast: The Enchanted Christmas: Special Edition and Beauty and the Beast: Belle’s Magical World: Special Edition. There’s just one more day until the Walt Disney Pictures animated classic Bambi is released on DVD and Blu-ray 2-Disc Diamond Editions. 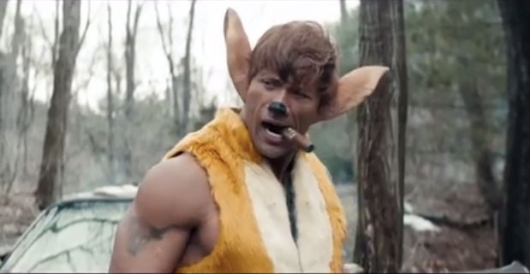 The studio already revealed a look at some characters planned for the film that didn’t make the final cut. Now, we have some bonus clips from the Blu-ray regarding the establishing of important characters; the voices of Thumper and Faline; and the music of the film. The Walt Disney Pictures animated classic Bambi is coming to DVD and Blu-ray 2-Disc Diamond Editions on March 1, 2011. In anticipation of the release, Disney has revealed some sketches and story details centered around several characters who were cut from the film during production. Check out the slideshows here below of the character sketches and accompanying story details. The lost characters were originally set to be forest friends who Bambi meets throughout the film: buddies Squirrel & Chipmunk; the grouchy Hopper; and the ill-tempered Bee. Walt Disney Studios Home Entertainment will be releasing their classic animated feature Bambi as a 2-Disc Diamond Edition Blu-ray/DVD this March 1, 2011. The Diamond Edition DVD/Blu-ray Combo will be available for a limited time in two different types of packaging, both of which are available for pre-order right now: DVD Packaging (image at top right) and Blu-ray Packaging (image at top left). The Diamond Edition comes packed with special features including two never-before-seen deleted scenes, a deleted song, a digital exclusive “The Golden Age,” and more! See listing of special features here below.